Plant development and productivity are negatively regulated by environmental stresses. The loss of productivity is triggered by a series of morphological, physiological, biochemical and molecular stress-induced changes. The development of diverse strategies to obtain stress-tolerant plants is currently one of the most active fields in plant research, which is expected to help prevent the dramatic reduction in crop yields due to global climate changing effects. Therefore, the identification of stress-regulatory genes and signaling molecules involved in the process of stress tolerance should allow the development of novel strategies to obtain tolerant plants. Polyamines (PAs) are polycationic compounds with a recognized role in plant growth and development, as well as in abiotic and biotic stress responses. 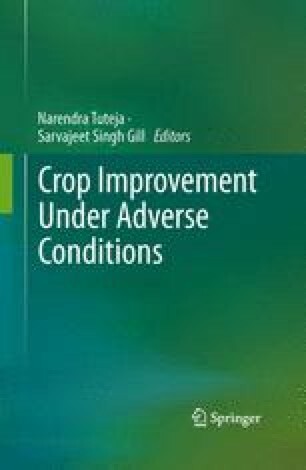 In this chapter, we review and discuss the information concerning the modifications in polyamines levels in response to drought, salinity and cold stresses, focusing on crop species. The comparison of common and specific responses in different crop plants suggests the view that polyamines actively participate in stress signaling through an intricate metabolic network. However, the precise mechanism(s) of action by which PAs could protect crop plants from challenging environmental conditions remains unclear. This work was supported by grants from PICT of Agencia Nacional de Promoción Científica y Tecnológica (ANPCYT, Argentina), Consejo Nacional de Investigaciones Científicas y Técnicas (CONICET, Argentina), San Martin University (UNSAM) to OAR. OAR also acknowledges grants-in-aid from COST-Action FA0605. MEG and FDE are fellows of CONICET (Argentina). ABM, SJM, AAR and OAR are members of the research committee from CONICET (Argentina).